Zimbabwe’s political chaos is a function of its economic crisis – and the economy is only getting worse. To all intents and purposes, Zimbabwe is broke. The government has so little income that it is struggling to keep the lights on in ministry buildings and pay civil servants. It certainly does not have anything to put toward servicing its existing $16 billion debt obligations. Citizens, too, are feeling the pinch, as inflation spirals out of control. The attempt to reintroduce liquidity into the US dollar-based economy by creating “bond notes,” a pseudo-currency issued by the central bank, has failed spectacularly. Bond notes now trade on the black market for less than 30 percent of their face value, leaving citizens – many of whom are paid in bond notes – unable to pay for basic necessities like food and fuel. Even if they could pay, shops are struggling to stock their shelves as they do not have the hard currency necessary to pay for imported goods. The irony is not lost on Zimbabweans, who have already experienced an economic meltdown once before. During the height of the last crisis, in 2008-2009, the government flooded the economy with cash, causing record hyperinflation. This time, it’s the scarcity of paper money – specifically US dollars – that is causing the problem. The impact, however, is much the same: a devastating economic crisis compounded by a repressive government trying to maintain control via the barrel of the gun rather than sound fiscal policy. In 2008, following contested elections, ruling party thugs launched a vicious crackdown on opposition party members. There were thousands of reported assaults. This time around, the crackdown has arguably been even worse. It began last week after President Emmerson Mnangagwa – the man who ousted his mentor, Robert Mugabe, in a 2017 coup – announced a 150 percent hike in the fuel price. Trade unions called for a nationwide strike, which was widely observed, albeit with incidents of looting and violence. In response, state security forces launched a coordinated assault on supposed opposition strongholds, dragging people from their homes, beating people in the streets and using live ammunition to control crowds. This was all conducted over the course of several days, under the cover of an internet blackout that was effective in restricting the flow of information from the country. By the end of the week, the Zimbabwe Human Rights NGO Forum had recorded 844 human rights violations, including 12 deaths. Most can be attributed to state security forces or militias aligned to the ruling party. Hundreds of people, including civil-society activists, opposition-party members and trade unionists, have been arrested. 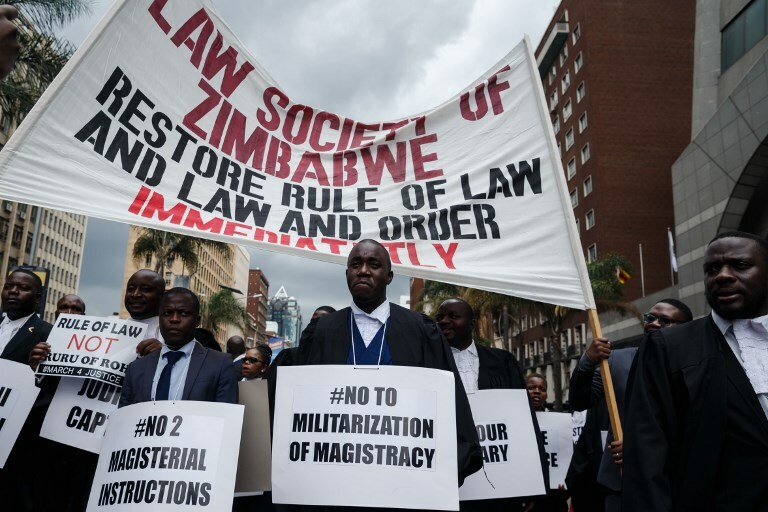 The violence has greatly complicated Zimbabwe’s efforts to raise money from the international community. Mnangagwa was due to attend the World Economic Forum in Davos this week, in an effort to woo investors, but had to cancel his appearance. In light of recent events, he can hardly make the case that Zimbabwe is ready for reform and open for business. Even countries like Russia and China, who may not be put off by the ongoing human-rights violations, are unlikely to put their money into an administration that cannot demonstrate that it can maintain stability. But some respite for the embattled government may be around the corner. Zimbabwe is heavily reliant on tobacco sales to generate foreign exchange, and the first tobacco auctions of the season are tentatively scheduled for mid-February. “We always have a drought period of foreign currency between the second half of the year up until when we start having tobacco sales,” said George Charamba, the president’s spokesperson, in an interview with the Daily News earlier this year. Last year, record sales – 250 million kilograms worth $729 million – helped to alleviate the foreign exchange crunch, and the government will be hoping to post similar numbers this year. But even new record-setting tobacco sales may not be enough to rescue the government this time around. Poor climate conditions are predicted to lead to a reduced cereals crop, according to the Food and Agriculture Organization, leaving 2.4 million people – 28 percent of the population – needing food aid. This is more than double last year’s figure of just over 1 million. Zimbabwe’s political crises have always been exacerbated by its economic situation. With the economy already in the doldrums, and a poor harvest still to come, we can expect more popular unrest – and, if this last week is anything to go by – lots of violence still to come.